There is a very very exciting smart ring on the horizon, called the Xenso S-Ring. It has been very successfully backed on both Kickstarter and Indigogo, raising over $1m (USD) and is currently in pre-production. Let’s take a look at this awesome sounding smart ring and help to answer some questions you may have about how it will work. It’s an impressive list, and it will be incredible to see this many features come to life when the ring is launched. But before we get into the features, let’s take a look at the ring itself. There is no doubt, the Xenxo S-Ring looks amazing. A big issue with having a ring with this many features is the inescapable fact that you need to fit a whole lot of tech inside. And who wants a chunky ring on their finger!? So it’s even more impressive when you look at the Xenxo, because it’s not that big at all! The way that the ring curves has an organic feel to it and not only provides more space inside to store the circuitry and battery, but gives the ring a distinctive look and feel. Let’s go through each feature in detail, so you understand i) what is is, ii) what it will do for you, and iii) how it works. This is probably the flagship feature for the ring. It basically allows you to take phone calls without touching your phone. When your ring is paried with your phone, and you phone rings. You’ll be able to tap the ring, then by placing your fingertips over your ear, you’ll be able to take the call. How does this work? Well, the Xenxo S-Ring has a built in microphone and speaker. So when you place your fingertips over you ear, it creates a little handset. The sound from the speaker is amplified in your cupped hand, and the microphone is situated so that it picks up your voice. 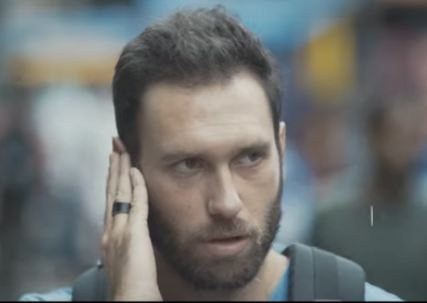 This is unlike the Orii Smart Ring, which uses the vibrations in your ear to transfer the sound. 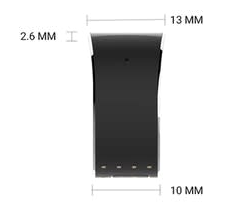 The Xenxo S-Ring uses a more traditional bluetooth connection to take the call. It’s exactly the same has wearing a bluetooth earpiece to take a call, only with the Xenxo, you can do it without having to wear an earpiece. The Xenxo S-Ring comes with 4GB of flash storage. This is the same storage format that you find on a USB stick. In fact, you can consider this feature EXACTLY like that of a USB stick. The ring will ship with a USB dongle. Just insert the dongle into your device (eg your computer), then attach the ring to the dongle and you’re all set. You can no transfer and store up to 4GB of data on the ring. This is enough for 4 feature films, all stored on your finger! Many smart rings claim to store data, but in most cases, this is a VERY small amount of data stored in the NFC chip. This might be useful for confirming your identity for example. The S-Ring however, is genuine flash storage. You can store whatever you want and 4GB is fantastic for such a small device. If you’re concerned about security, don’t be. To access the files, you need to use the Xenxo app to identify yourself (eg with TouchID), before you can access the files. This added security measure means that if you lose the ring, you’re not giving away access to something important. This feature is becoming more and more of a draw card for smart rings. 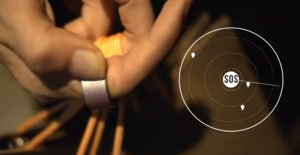 The way it works is that the ring has technology that can detect movement. Specifically, the S-Ring has a 3 axis accelerometer and proximity sensor. This can then be harnessed to control other devices. For example, if you were streaming music from your phone and wanted to change the track, just activate the S-Ring, twist your hand in a predefined manner, and the track with change. Another example might be that you could increase volume by moving your hand up. It’s a pretty cool feature, and don’t underestimate it. As more devices are connected to the web, this type of control can become really useful. For example, with the right type of setup, you could open your garage door as you approach your house, simply by activating the ring and gesturing. So having this feature may not seem that appealing to some – but we think this might end up becoming one of the main drawcards for smart rings. How many of you set alarms at home, to wake you? Yep, almost everyone. How many of you wish you could get up at the time you want, without waking others in the room or your house? We thought so, quite a lot of you. The S-Ring comes with a silent alarm. This means you can set an alarm on your phone, and instead of sounding a loud alarm, the ring will vibrate. This will wake you up, but leave anyone else around you unaware. We think this is a really nice little feature, and it is so simple, we’re surprised that other manufacturers don’t include this as a standard. NFC payment is the same as contactless payment that we’re all quite familiar with now. Instead of pulling out cash, we can pay with a compatible card or phone. The Xenxo S-Ring has this exact functionality built in. So when it is paired with your phone, you can use it in the same way you would your phone or smart watch. It will be able to be used anywhere where contactless payment is accepted. From a practical standpoint, this is a massive winner. Convenience is king, and being able to just hold you hand near a payment device to buy things is awesome. 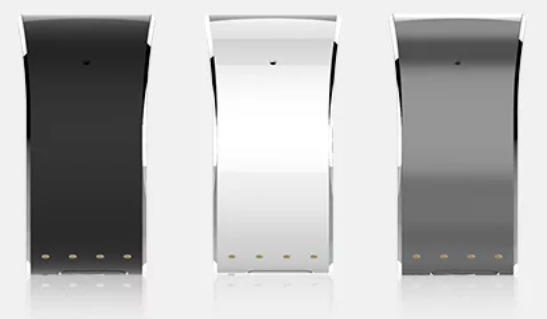 The S-Ring will be able to help you reach your health and fitness targets by tracking your steps. This can be used to track calories burned. this is then enough to set targets, and the ring will vibrate when you reach your daily goal, eg 10,000 steps. Whilst some smart rings will track things such as heart rate (check out the Motiv Ring here), the S-Ring will only track steps. In this sense, it is not as advanced as other smart rings in this area, though with the huge range of features here, that’s not surprising. Personal safety is a massive concern for everyone. Many smart rings have zeroed in on this fact and offer really effective security features for wearers. Check out our post on safety smart rings to learn more. The S-Ring can provide you with peace of mind. 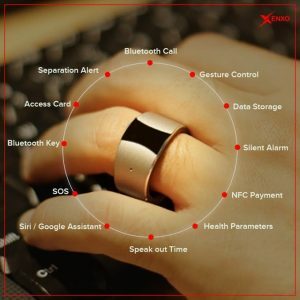 If you feel unsafe, just long press the button on the ring and a notification will be sent to a predefined list of contacts that you set up using the Xenxo app. It’s very simple and we see this being a huge selling point for any smart ring. A rather curious feature of the Xenxo S-Ring is that you can get it to tell you the current time. It’s easy to perform, just double tap the button on the ring, then cup your hand over your ear (as you would for placing a call). The ring will then tell you the current time, through the inbuilt speaker. If you consider that one of the main goals of a smart ring is to allow you to leave your phone in your pocket, then this feature makes sense. You can get the time without finding your phone. However, given most people wear a watch, we’re not sure that this feature will get a lot of use. Presumably, it was easy for the folks at Xenxo to add in. 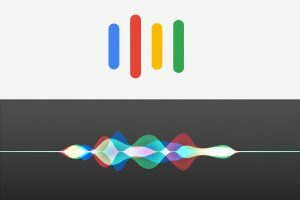 A much more appealing feature is the integration with Siri and Google Assistant. By triple tapping the button on the ring, you can activate these assistants and use them just as you would if you were speaking into your phone. We really love this feature, as it has so much to offer in convenience. With smart homes becoming more commonplace, this would allow you to control not only your own phone (eg to set a reminder), but to control you own home. A bluetooth key is simply a device that allows you to replace a standard door key. If you have a compatible bluetooth door lock, you will be able to open it with the Xenxo S-Ring. This is another feature for the IoT (internet of things) and smart home community. Similar to the bluetooth key, an access card is almost the worldwide standard for access offices. They look like thick credit cards, and are coded to individuals, allowing organisations to control who accesses their premises. The S-Ring is able to take the place of the access card, working very similarly tot he bluetooth key feature. Of course, before you’re able to leave your access card at home, your organisation would need to support this technology. All of the features that we’ve gone through have something in common. To work, the ring needs to be in close proximity to your phone. So Xenxo have added an alert that tells you whether you are outside the range needed to allow all the features to work. The accompanying app will allow you to control everything about the ring. 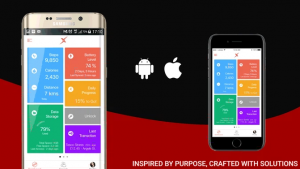 Compatible with Android 4.0 or later, iOS 7 or later, Windows 7 or later and MacOS 10.8 or later….the app will work with just about every modern phone and computer. Xenxo claim that the battery will last up to 5 days in standby mode. That is pretty amazing. In terms of talk time, there is up to 3 hours available. 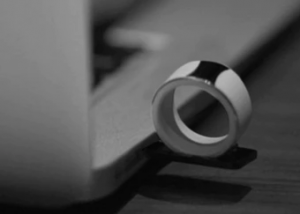 The ring will take around 45 minutes to reach full charge, and charging is achieved with the USB dongle. The ring itself is not as slim as other rings on the market, but with the amount of features packed in there, that’s not a surprise. The ring somes in 9 sizes, from 7-15. There are also 4 color variants, black, white, grey and rose gold. This should keep everyone happy we think. Wow, we’re exhausted. It’s a hugely impressive list of features and we can’t wait to get our hands on the Xenxo S-Ring and put it to the test. If you’re looking for a very slim ring, or one that makes a fashion statement, then the S-Ring is probably not for you. However, if you’re looking for “one ring to rule them all” in a stylish design, then we recommend getting your hands on the Xenxo S-Ring. Here here to read more about the Xonxo S-Ring. This entry was posted in Ring Reviews and tagged bluetooth, health, safety, SOS, Xenxo. Bookmark the permalink. ← Is there a Microsoft Smart Ring with gesture features on the horizon?